Playwright and . . . naturalist? 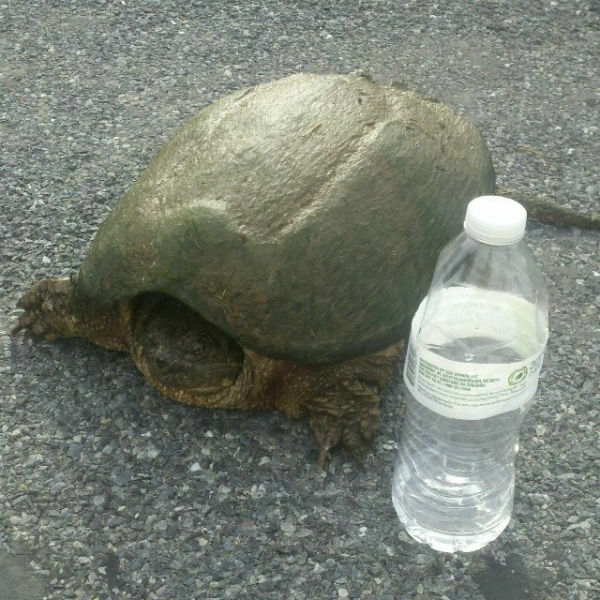 The first eastern snapping turtle recorded in Botetourt County, Virginia. Who knew? Almost every morning, I take a walk. To breath in the fresh country air. To exercise body as well and mind. This morning, as I was hoofing it back home, I looked up and . . . “holy crap!” (Actually, I said something a little more colorful). There was a giant turtle crossing the road. And doing so at a pretty good clip for a turtle. Naturally, I did what anybody else nowadays. I took a picture with my photo, and posted it to Instagram, Twitter and Facebook, where a small fight soon broke out among some of my Facebook friends over just what species it was. Eventually, they all agreed, but that’s getting ahead of the story. Fellow Botetourt County filmmaker (and Girl Scout leader) Jane Garnett identified it as an eastern snapping turtle, and provided a link to the Virginia Herpetological Society’s turtle page as proof. There, I discovered an email address called “animal identification,” so I clicked it and sent ’em my pix of the turtle in question. Recognition? Who knew! So now can I add “naturalist” to my name? County record: Approximately 8:30 a.m., I observed a large turtle crossing Mount Pleasant Church Road, northeast to southwest. It was coming from a field with a large pond and moving toward a larger field which eventually leads to Borden’s Run, a small tributary of Catawba Creek. Three smaller ponds are also nearby, so this is a water-rich area. When the creature saw me, it stopped in the middle of the road. I sat down a water bottle beside it for a size comparison and the turtle appeared to hiss or snap at either me or the bottle. A digital photograph of the animal is attached. Throughout the encounter, the turtle stuck its head out of its shell and made aggressive-looking actions toward me. After I was a safe distance away, the turtle resumed its crossing of the road. When I drove through the area about 30 minutes later, it was gone. I sent the photograph to the Virginia Herpetological Society, which formally identified the turtle as an eastern snapping turtle. Several years ago, I observed another very large turtle crossing the road in the same area but was not able to get a photograph of it. Many box turtles are often seen in the same place. This entry was posted on May 22, 2014, 11:07 pm and is filed under Personal, Uncategorized. You can follow any responses to this entry through RSS 2.0. You can leave a response, or trackback from your own site.